Ok i got bored with the old theme. hurm .... trying hard to restart blogging .. been quite occupied recently and been procrastinating on blog for quite a long time ..
Inigo Consulting is growing slowly and steadily. We're getting better in our specialization stack : Plone, Zope3, Component Architecture. We're discovering lots of new ways to be efficient and modular in coding stuff in Python by utilizing the tools and libraries from the Zope Toolkit and stuff developed by the communities surrounding Zope. (eg: buildout, zope.component, zope.schema, grokcore.component ) by utilizing them for non-zope stuff. Learning new ways to package and maintain python eggs, unittest, by utilizing buildout and a number of buildout recipes out there. Back in PyCon APAC last week I was introduced to hurry.resource by its author, which is also one of the founder behind Grok, Martijn Faassen. So, what does it do?. Note to self: don't use list as a default value in class methods if its going to be modified later, as it might cause some trouble. At first i thought its a bug/weirdness, but after banging my head a bit to wall and a long stare at the ceiling, it made sense. I was looking around for template inheritance solution for repoze.bfg, as it seems like by default, BFG does not have context view traversal support to acquire template macros. Those who are familiar with BSD Jails or Solaris Zones might be quite familiar to the concept of OS-level virtualization. 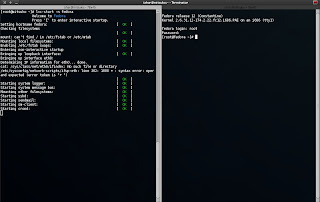 The Linux world have several options for this, such as the User Mode Linux (UML), OpenVZ, Linux Vserver, and most recently, Linux Container (LXC). Unlike the other alternatives, which requires specially patched kernels to run it, LXC got fully functional in the upstream kernel since 2.6.29, which is a plus as it made it easier to deploy it in many prexisting distros which ship 2.6.29, including Fedora - without messing around with the distro packages. FOSS.Org.MY (formerly: MyOSS) Meetup is BACK!!!! with a new name, and a new format, and new timing!! We will be having Lightning Talk session after the speaker's talk, if you have anything to share, do contribute to the Lightning Talk. A general overview of OSS used in Digital Content Creation industries with a focus in animation production from small personal projects to Hollywood production. Src.rpm here: wizardpen-0.7.0-2.fc12.src.rpm. It worked for me, but your mileage might vary. 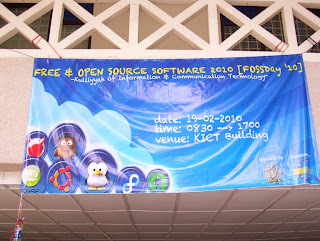 Back on 19th Feb 2010, Fedora-My was invited to IIUM FOSSDay 2010 to give some talks and to handle an installfest. Me (fas:izhar), and Snittit/Zul (fas:sniffit) , Rizal and Meng went there representing Fedora-My. Crowd for the talk was rather large, around 20-30 people, and for the installfest was, there was around 10-20 people , came and go. 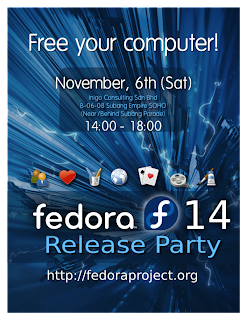 Bunch of Fedora 12 LiveCDs was given out to the crowd during the event, especially to the installfest attendees. Just discovered this when I was glancing through the pystream (a CUDA library for Python) source codes. In Python2.5+, it is possible to directly load simple C shared libraries from Python without the need for writing C wrappers for it. (SWIG or manually writing one). This can be achieved using the Python ctypes module. Hope this would be useful to someone. Video which describes etymology of Allah & Eloh, and the proper word to use to describe GOD - from the Deen Show. "Allah - The best word to describe the GOD of the Jew, Christian and the Muslims, because this is the GOD of Adam, Abraham, Moses , David , Solomon, Jesus and Muhammad (Peace Be Upon Them All)"